Everton are stepping up their interest in re-signing striker Wayne Rooney from Manchester United. There is increased momentum behind a deal to take Rooney back to Merseyside. The future of the the 31-year-old, who started 15 Premier League games last season, has been the subject of speculation for several months. The United captain's long-time adviser Paul Stretford held talks over a possible move to China in February. Rooney began his career at Goodison Park before joining United for £27m in August 2004. Everton's major shareholder Farhad Moshiri would regard Rooney's return to Goodison Park as a major coup. 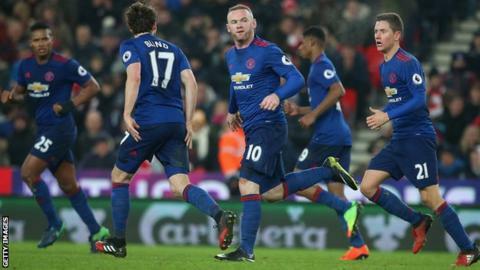 Rooney has said repeatedly that he would not leave Old Trafford for any Premier League team other than Everton, although it is understood that they are not the only club interested. Rooney, who has a contract with United until 2019, has seen his playing opportunities limited under Jose Mourinho's management. Asked in May if he wanted to stay at Old Trafford, the former England captain said: "Of course. I've been at this club for 13 years, but I want to play football." Everton's director of football Steve Walsh said in February that "it would be wrong" to ignore a potential deal for the forward, who is United's record goalscorer. Real Madrid's Alvaro Morata, 24, has emerged as United's preferred striking option to replace the injured Zlatan Ibrahimovic - with any deal likely to mean Rooney will be allowed to leave Old Trafford. Mourinho's side are scheduled to report for pre-season training on Saturday before leaving for a five-match tour of the United States the following day. All parties are remaining tight-lipped on the details of negotiations. Rooney's best days may be behind him but he still retains a global status - making him the perfect acquisition as Everton continue their fiercely ambitious strategy of demonstrating their determination to be major players once more. He remains one of the most marketable players in England. Everton don't have anyone who comes close.